Festive decoration ideas this Christmas! That's right folks: we're heading into the festive season for another year, with Christmas time fast approaching on the horizon. Christmas time in Hong Kong is a magical time of year, and it can be made all the more joyous by turning your home into a truly festive haven just like the city's malls, shopping centers and public spaces. A huge part of celebrating Christmas revolves around bringing friends and family together for a delicious meal of good food, drink and connectedness. However, it's also about the weeks leading up, and the extent to which your domestic environment reflects the festive spirit. Today on homify, we're getting ahead of the pack and getting you covered with eight fabulous home decoration tips for the coming festive season. With a few tricks, tips and tools up your sleeve, and some wise decorative insights, you're home can't help but become a truly magical festive wonderland. We begin our Christmas transformation with the all important living room mantelpiece. While the mantelpiece remains a generic decoration space during the 'non-Christmas' 11 months of the calendar year, it really comes into its own during the month of December. Whether you've got a roaring festive fireplace beneath or not (probably not in Hong Kong, but you never know), the mantelpiece is a perfect place to express your verve and enthusiasm for the advent of the Christmas season. Here, decorative angel wings sitting mantel-side make for a beautifully simple Christmas gesture. A trio of booties hang like monuments above the mantel itself, in wait for the goods to come on the night of the 24th. And, of course, if you position a gorgeous, lush Christmas tree replete with coloured baubles and star by the mantel side too, you'll have yourself the best looking Christmas mantelpiece area this side of the North Pole. Finding the right balance with Christmas design can be tricky - why not contact a professional for a little extra advice and assistance. Lighting is a crucial year-round ingredient for an evocative home interior, but it's around Christmas that lighting becomes especially important to the mix. Good lighting exemplifies and underscores the symbolic illumination of Christmas time, when peace and joy become especially revered. Why not light up your Christmas months with something fresh, enticing and joyful to look at? 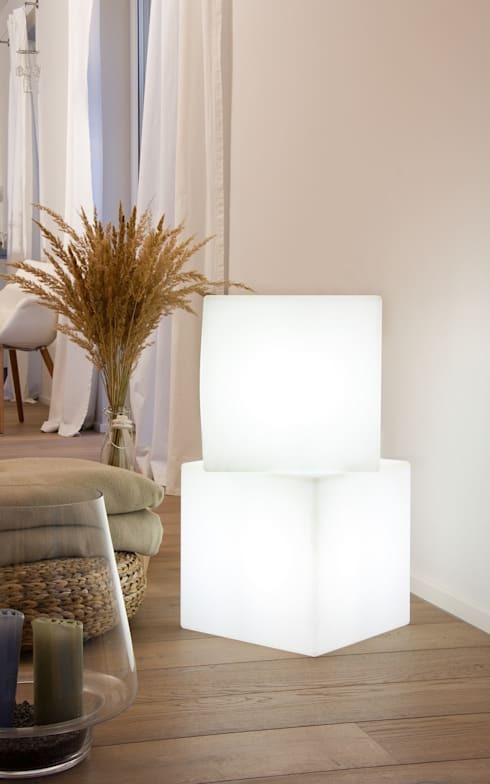 Take this amazing example on board: ethereal, glorious light cubes, illuminated with white globes—something like this ticks all the boxes: fabulously unorthodox room feature; a virtual piece of living room art; as well an excellent source of Christmas light that'll make your whole home glow (especially when night time falls and all the other lights in the house are switched off). Straight out of Santa's workshop. Beautiful. On those excitable, giddy nights through December, why not make your lounge room space that little bit more laid back, whimsical and harmonic? Christmas is all about pleasure and happiness, and it's in the lounge room that we love to find ourselves feeling this way. Double the pleasure and happiness with a setup just like this: a cosy room with gorgeous, dimmed wall lighting, and romantic festive candlelight by the corner bookshelf and coffee tables. A festive red couch certainly helps, not to mention a delightfully festive throw rug. With simple additions like these, you'll be kicking back with extra special Christmas joy this December. Now this is Christmas dining and a half. The old saying 'less is more' is true for the most part, but perhaps not when the festive season hits. Dining together with family and relatives is the thing to do during the two-day public holiday in Hong Kong, and it'll make that occasion all the more bright and unforgettable if you're dining space is done up in style. 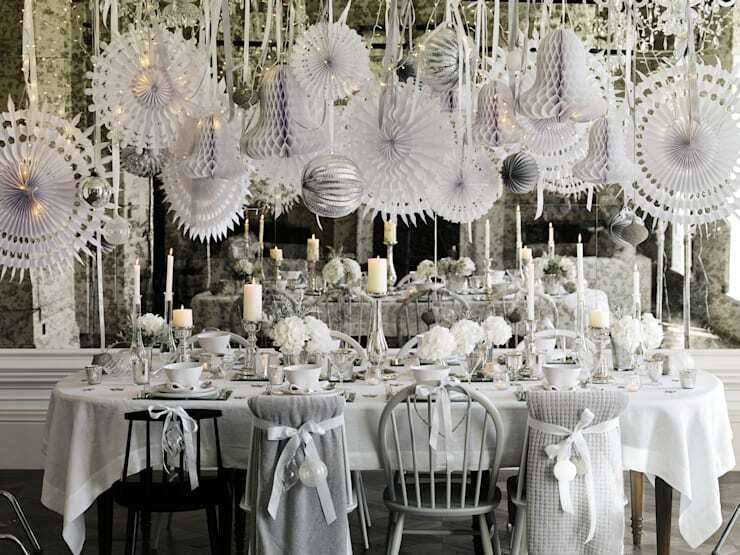 Here, the designers have made the absolute most with the space, decorating this dining table with an dizzying array of Christmas shapes, patterns and trimmings: tied knots and grand candles in multiple sizes, with a silver, white and grey colour motif that restrains the abundance perfectly. Consider draping some fantastic lanterns and paper snowflake cut outs from the ceiling for that unparalleled festive touch. As we've said before, when it comes to Christmas, opulence and grand gestures are most definitely in (if not the festive season, when else?). The weeks between the start of December and first week of January are your excuse to go that extra step with your domestic design proclivities, so be sure to mix it up and make the most of the opportunity. Of course, Christmas is all about setting the mood, and first impressions in this regard count for a lot. 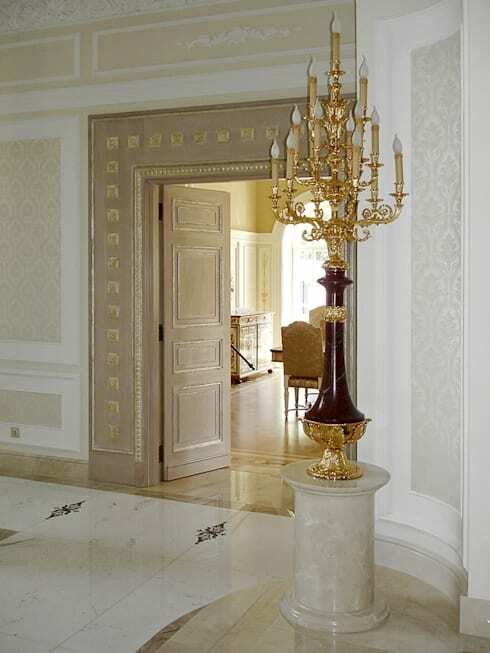 The entranceway to any home is where first impressions are made, but during Christmas time, the entrance really sets the tone. As well as the obligatory wreaths and faux reindeer heads, consider something grande and wonderful like this majestic candelabra: Christmas is all about illumination and warmth, and feature entrance lighting such as this are a great way to entice, excite and set a great festive mood. Christmas is always enjoyed by the adults, but it's really for the kids isn't it? Whatever your Christmas decoration style, it's always important to appease the young ones this time of year. Playful festive patterns around the house can make fantastic extra flourishes of joy for everyone in the home, but especially the kids. Take these cute and wonderful stairwell additions for example. 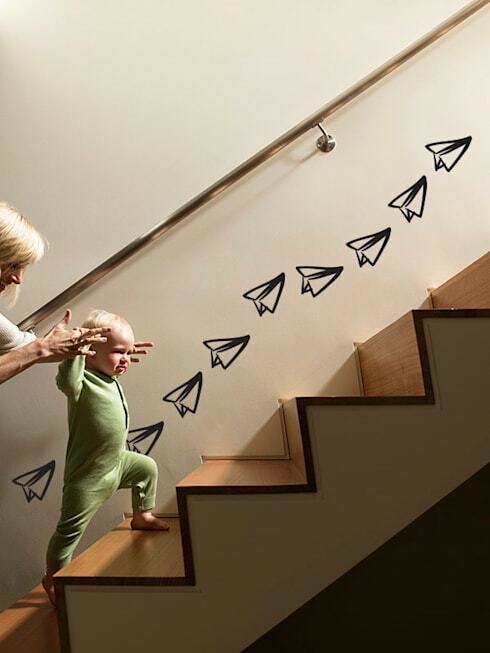 If paper planes aren't your style as such, consider snowflake imprints, Santa faces, miniature reindeer and snowmen: get creative, get your DIY skills happening and turn your stairwell into a fun, friendly and happy Christmas space for all. While all that great food might be deployed and devoured in the dining room, it all begins in the kitchen. 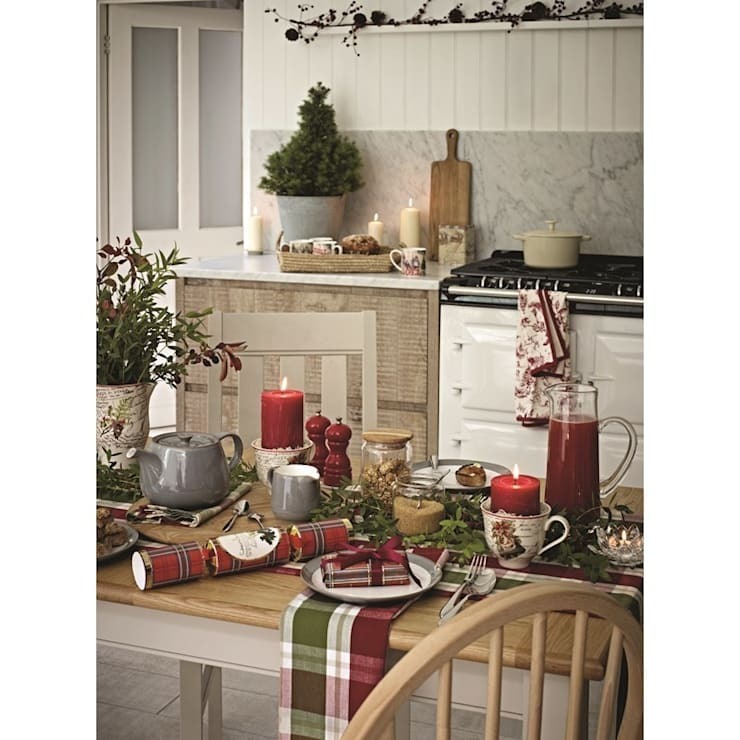 There's no reason why the kitchen shouldn't enjoy just as much festive treatment as the rest of the house. Whether your kitchen is stand alone or open plan, it doesn't matter: make the most of your food preparation spaces through December and reach a new level of Christmas fabulousness. Here, the occupants have added some crucial, though very simple elements to make their kitchen space that extra bit festive: miniature potted fir trees next to white lit candles; vine cuttings draped above the stove area; not to mention a good selection of colour and joy—bon bons, plants and seasonal crockery—right across the kitchen table. 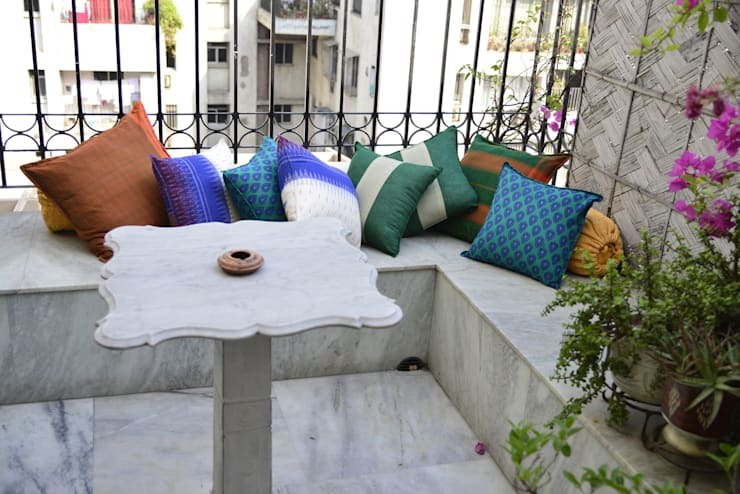 Lastly, if you happen to have a balcony space or garden area, be sure to brighten it up this Christmas with a brilliant burst of colour. Here, a seating and table area simply sings with the inclusion of festive Christmas cushions. Get colourful and have an extra merry, and vibrant, Christmas in 2015. Did you enjoy that Ideabook? Why not take a look at Mobiles and Hanging Sculptures for a little extra Christmas inspiration. What did you think of these fabulous Christmas interiors? Do you have any tips for our festive decoration readers?